One Prime Week Left in 2019...Price Reduced! You will 'Smile Away' all your everyday stress in this lovely seaside home. See our weekly rates! deck, bask in the sun by the pool or go exploring on a leisurely bike ride. Third Floor offers King master, greatroom, a fully stainless kitchen and powder room. also has 1 with King and Trundle, 1 with 2 twins, and 1 with 4 Bunks. 2 Queen bedrooms (both with their own lockout full baths). 9 TV's; Includes Blue Ray, Netflix, ROKU and Directv; 50' HDTV. Flat screens in all rooms. 25 year old leaseholder minimum. Hello..I'm John Carter - owner of SmileAway. 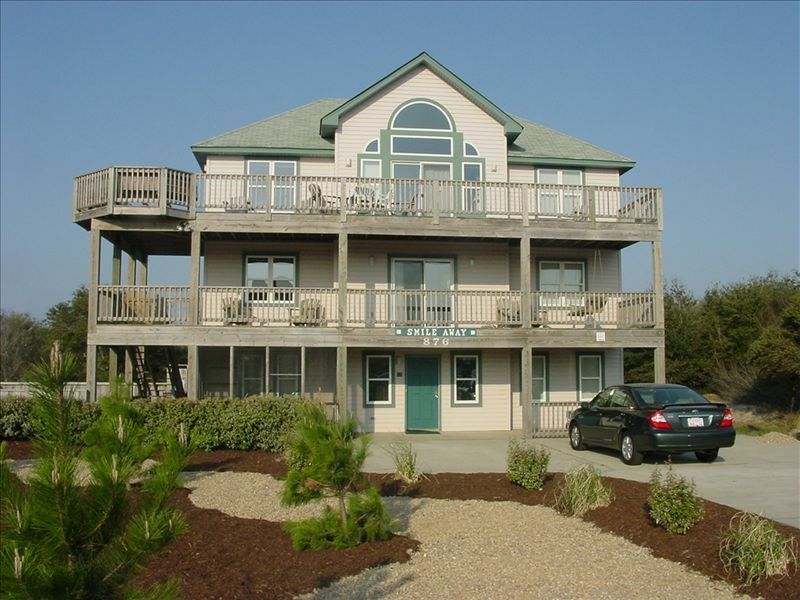 My home in Corolla is the ideal spot for your large family vacation. I've personnaly selected all the furnishings and take personal responsibility for all the maintenance and safe upkeep of this property. I take pride in ownership, and seek to have our guests total satisfaction. When you arrive at SmileAway, we want you not to be suprised, but to be excited that everything you've learned about SmileAway on the web is as it has been described. Modern, clean, well equipped and tailored for the ideal beach vacation. Smileaway is located in the Whalehead subdivision of Corolla, NC. This means there are large, clean and uncrowded beaches. It's close to important shopping amenities like a grocery store, beach accessories and numerous restaurants. But its 20 miles from the crowded suburbia of Kitty Hawk or Nags Head. Smileaway has excellent amenities, which can appeal to all age groups. We have games, out door activities, high-speed wireless internet and many beach related accessories like carts, chairs, boogie boards. Our location to the beach is ideal..not so far so it's any easy, short and safe walk. And you don't have to pay oceanfront prices. Also includes 1 bath towel and wash cloth per guest, 1 hand towel per bathroom, bath mats, and kitchen towels. Stainless -Bosch. Highly soundproofed so its very quiet. Top level floor includes icemaker. High End Stainless double oven with 5 cooktop positions. (2) - one in kitchen, top floor; one in rec room for heating snacks and coffee etc. 50 HDTV in main living; TV's in all bedrooms and rec room. All BRs have HDTV flatscreens and local TV, Netflix or Directv. Includes Netflix. CHildrens VHS movies available. Local redbox service is available. (6) Romantic swing & numerous chairs. fits 8 of your closest friends. Everything about the house was amazing, close to the shops, food, etc. would recommend smile away to everyone! Thank you John for the rental of your wonderful home if we ever get a chance to come back that way we will definitely look you up again. Great location, close to the beach, shopping, entertainment, and the grocery. We had a large group, plenty of space for all of us. The house was decorated in a nice beach theme, we had a great time. Due to all the rain and flooding, sometime getting to the beach was a challenge, but we powered through. We climbed up the lighthouse, saw a few horses, played mini golf on the natural grass course, and enjoyed the pool and hot tub. Now, for the negative, all related to housekeeping and maintainence. There are so many cobwebs in the house that obviously haven’t been touched for a long time, the grill had months of grime on it, that my husband spent an hour trying to get it ready for use, rusty nail around the property from a roofing job, so could not use the volleyball court, outside of house is not being maintained. When we arrived, the two comforters on lower level were so dirty I had to was them before use. This is an amazing space, it just needs a responsible msintainence company, that demands proper house cleaning!! Deanna - thanks again for your business and appreciate highly your prompt feedback. This is very valuable for us and helps us continue to improve the property. I would like to comment on the maintenance items you mentioned. - cobwebs - this is always a difficult struggle. This home is located in a remote, rural location, and it doesn't take but a few minutes of leaving doors open to cause this. We have the house checked for this every week. Re: the grill - we rely on the users of the grill to clean up afterthemselves, and apparently this did not happen. However, cleaning this is much easier if you load the coals, heat it up and it will brush off in about 2 minutes. It's hard to clean when cool. Rusty nail - no excuse for this, and as you mentioned ,we just put a new roof on recently. Our roofer is a reputable long time contractor at OBX and has done very well. We do caution all users to check for any debris prior to use. But thanks for the info. Thanks again for your stay and candid feedback. Much appreciated. We had a grand week at Smileaway. We had ample space and the property was in good condition. The owner was very responsive when questions arose or small issues required assistance. Very nice location. Plenty to do. The pool, hot tub, pool table etc made it a very fun week. The only issues were with he security system. Which was not working when we arrived. We set it per the managers request but one of the panels never did set up properly. After we left we were told one if the other panels plugs was incorrectly inputted and was turned off by a wall switch. It is unclear how this happened. That was he only issue if the week. Fred - thanks again for your feedback and apologize for the security system inconvenience. There was a slight malfunction of one of the sensors and had some difficulty with ADT to get it repaired. However, please note that the ADT security system significantly enhances the safety of the occupants of this home by providing a highly advanced smoke/fire detection system - much more than the average $15.00 units sold at Home depot. The safety and security of our guests is job #1 and we are doing our best to keep the home as safe as possible. Apologies again for the inconvenience. Thanks again for your business and we are glad that we met your expectations!. We appreciate your feedback and hope we can serve you again! Everything was great. The House was very clean and had everything we needed to have a good time. Highly recommend. Maybe not the greatest place for elderly relatives. It has a lot of stairs but I get it it’s a huge house. Thanks for your kind words, and for your business. We aim to please and glad we can be of service. Glad you all had a good time. Thank you again! Yes, there are a lot of stairs. Thanks for your feedback and we appreciate your business. Great feedback during the stay too!